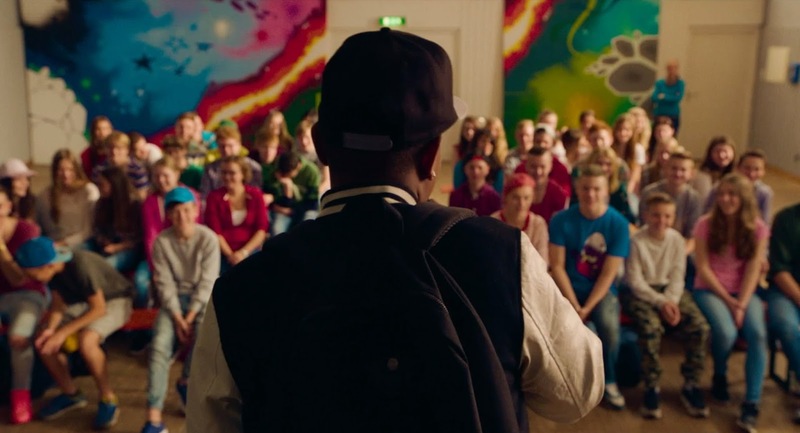 Chad Hartigan writes and directs Morris from America, a coming of age chronicling thirteen-year old Morris’s (Markees Christmas) transition to life in Germany. The combination of US and German sensibilities makes for an intriguing combination with a real aesthetic kick, despite a narrative that feels somewhat forced and contrived. Curtis Gentry (Craig Robinson), an American single father living in Germany attempts to raise his thirteen year old son, Morris. The teenager takes the centre of this coming-of-age narrative as he navigates through Germany in the pursuit of romance from fifteen year old German girl Katrin (Lina Keller). In terms of style, Morris from America is an amusing, offbeat watch combining the classicism and contemporary worlds of Germany with US sensibilities.The fusion of American hip-hop culture – adored by Morris and his father – and small-town German life makes for a energetic mix and this is only furthered by a soundtrack featuring a host of classic rap tracks. Hartigan packs his film with a real visual clout and vitality with amusing cut-aways, snappy editing, and well-paced gags. Hartigan’s film is brimming with an infectious energy from highly-charged club scenes to the amusing warm moments of father-son bonding. Morris from America is primarily a coming of age tale with Morris’s journey from child to teenager taking narrative forefront. Hartigan explores that first-crush feeling in the form of Morris’s attraction to Katrin and captures a carefree fun in his willingness to do anything for her – even travelling to Frankfurt to watch her older DJ “boyfriend” Per (Jakub Gierszal) play a nightclub gig. Perhaps that's where Morris from America lost me – thirteen year olds in nightclubs, travelling cross-country, parties in castles. There’s just a real sense of inauthenticity behind this, which makes it a struggle to really get behind and rise above the American in Germany fish out of water concept. Despite this occasionally contrived feeling, there is a sense of fun about Morris from America, with Hartigan’s script well-pitched to Craig Robinson’s comic style. In one of his more dramatic roles, the actor captures the struggle and concern of a single-father trying to do the right thing for her son despite some opposition. Robinson and Hartigan manage to capture that fine-line in wanting a child to experience the world, but also the need to protect. Robinson and young star Markees Christmas have a convincing energy and the father-son dynamic between the pair feels authentic and is portrayed with a real sweetness and tact - even when events that surround them may not convince. Christmas is a charismatic young lead who manages to effectively portray the highs of a young teen experiencing the full sensory delights and fears of the ‘grown-up world’. Morris from America gains further heart from a sublime turn by Carla Juri who brings a sweetness and compassion for Morris to the fold. Torn between her duty to teach and care for Morris but also to avoid crossing the line and intruding in the teenager’s home life, Juri is a real standout here. Hartigan has crafted a vibrant and energetic watch packed with plenty of heart and good humour. Despite this, Morris from America never shakes that feeling of contrivance from its narrative – making it a challenge to fully invest in. Morris from America screens Friday 3rd of June and Sunday 5th of June at London's Picturehouse Central as part of the Sundance Film Festival: London 2016.